If you discover an opossum under a shed or porch, you might want to remove it. 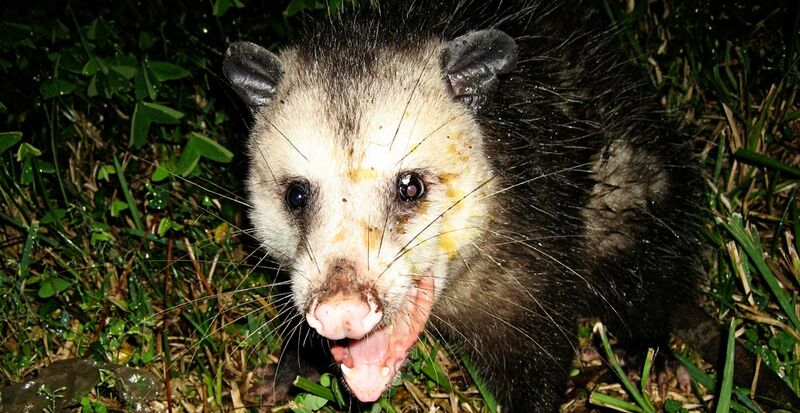 Opossums can be smelly, and create a terrible mess with feces, urine, and food debris. If you decide to take matters in to your own hands, here are some tips. Opossums will rarely fight to keep their home unless they have young. If you are removing a single opossum, if you make a lot of noise and commotion, they will probably move along. Because they are nomadic by nature, they know they can easily find a new home. If you scare them while trying to remove them, they will secrete a disgusting green slime with a horrible odor, and might possibly “play dead”. This is a defense to persuade predators that they are no good as food. Never try to remove them with your hands even if you think they are “dead”. They have opposable toes on their back feet that give them an iron grip, and extremely sharp teeth and claws. If they perceive a physical attack, they will defend themselves. If you are attempting to remove an opossum that has young, prepare for a fight. You will have t take drastic measures to make mom move the kids. If you still do not want to call in the professionals, you can try setting a live trap to capture mom and move the joeys after she is under control. If you decide to relocate them yourself, you will need to find a suitable area about 15 miles away to be sure they do not return to you. If you feel the need to kill them, a large snap trap suitable for a gopher or larger rodent will catch them and probably kill them. Many people think poison is the answer and that wrong. If the poison even works, it will take a long time for the opossum to die. It will probably retreat farther under the porch or shed to die, leaving you with a worse problem. If it happens to have young, and you kill it, you have effectively killed them as well the will most likely will starve, be eaten by a predator, or die of exposure. No matter what method you choose, once the opossum has left, place some kind of underpinning like hardware wire, or siding around your porch or shed to prevent this from happening again. Go back to the main Opossum Removal page for more information about How to get opossums out from under a shed or porch.